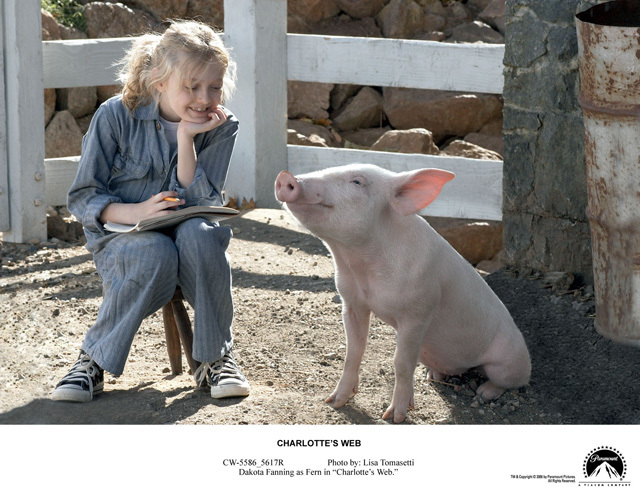 “Charlotte’s Web” began its journey to the screen when producer Jordan Kerner, previously the producer of such hits as “Fried Green Tomatoes,” “The Mighty Ducks,” “George of the Jungle,” “Inspector Gadget,” and many others, read E.B. White’s book to his young daughters. Kerner’s mother had read the book to him as a child, and he remembered it fondly. Moreover, the story champions the kind of bedrock values that appeal to audiences of all kinds: young and old, individuals and families. “The story is enduring because of its ideas  selflessness, friendship, and the creation of family where there was none before,” says Kerner, noting that these are issues anyone, young or old, can relate to. “We really wanted to make this movie for all audiences, not just families,” he says. Kerner wrote a 28-page outline with executive producer and Kerner Entertainment production head Paul Neesan. In addition to finding inspiration from the book, Kerner and Neesan spent a great deal of time researching E.B. White at the English department of Cornell University, from which White graduated and where his papers and other personal archives are kept. As a result, says Kerner, “throughout the movie there are many references to E.B. White’s life, and we’ve used much of his own dialogue,” says Kerner. The filmmakers chose an earlier draft for its cinematic and dramatic qualities: John Arable, Fern’s father, is in the barn and sees that his sow has given birth and that there are too many piglets for the mother to feed. Fern also wakes to the noise and runs out to the barn; seeing her father with the ax, she stops him from killing Wilbur. With their story in place, the filmmakers’ focus turned to the script. The producers knew that they wanted to stay fundamentally true to White’s novel. Kerner had admired the work of screenwriter Susannah Grant, specifically “Erin Brockovich,” which earned Grant an Oscar nomination. “She wrote a beautiful screenplay,” he says. “Karey gave tremendous life to the barnyard characters, and also added the comedic touch,” praises Kerner. Winick began his career as an independent filmmaker, eventually forming a company in the summer of 1999 with producer/lawyer John Sloss called InDigEnt (for “Independent Digital Entertainment”). The company was inspired by Dogme 95 (the Danish filmmaking collective) and vanguard filmmaker John Cassavetes. At the same time, “Charlotte’s Web” takes advantage of the very best that visual effects have to offer; this story could never have been told before in live-action until computer-generated effects made it possible. Whole sequences that could never have been fulfilled before come to life: for example, the camera follows Templeton down his rat-hole to his lair. Obviously, the only way to give audiences this rat’s-eye view was in the computer. The filmmakers were faced with an array of casting decisions  they had to cast live actors, actors who would provide voice talent, and live animals. With respect to the voice talent, “We thought outside the box,” explains Gary Winick. “We knew we could be eclectic, so we totally went for it. We threw out all kinds of names. Oscar winner Julia Roberts leads the voice cast as Charlotte, the nurturing spider whose friendship with Wilbur is the central focus of the book. Roberts had just given birth to her children, so the project seemed like a good fit for her. Roberts, embarking on her first vocal performance of an animated character, understood the importance of her portrayal of the adored arachnid. Still, Roberts loves the idea that a new generation of children will be introduced to this classic tale. “The book is about the most timeless concepts of our lives: fairness, compassion, understanding, and a willingness to stand up for what you believe in,” says Roberts. “Even Templeton, the most rotten of the bunch, can’t help but participate in what’s right. Dakota Fanning plays spirited farmgirl Fern Arable, who saves Wilbur’s life on the night he, the runt of the litter, is born. Kerner explains that Fanning was the first and only choice for the role. “Dakota was always the lead in this movie. There was never anyone that we wanted more,” he adds. “It was such a perfect combination of role and actor. When it looked like Fanning’s commitment to act in another film  Steven Spielberg’s “War of the Worlds”  might keep her from joining the cast of “Charlotte’s Web,” the studio and the filmmakers agreed to work around it. Fanning was equally delighted that a scheduling conflict wouldn’t prevent her from portraying a favorite character from a book she loves. “There are so many messages in the book and the movie. I’m honored that I get to bring Fern to life,” she says. The cast is rounded out by Kevin Anderson, who plays Fern’s father, John Arable, and Essie Davis, who plays Fern’s mother. Gary Basaraba and Siobhan Fallon play Homer and Edith Zuckerman, neighbors of the Arables, whose barn houses Wilbur and the other animals, and Nate Mooney plays the hired man, Lurvey. Beau Bridges brings great empathy and a sense of awe to his character, Dr. Dorian. The list of voices that comprise the “comic chorus” of the barnyard reads like a who’s-who of Hollywood heavyweights. Steve Buscemi takes on the role of Templeton, the rat who says he’s selfish, but who risks everything to save Wilbur. John Cleese  a veteran who has done voice work in several films, most notably “George of the Jungle,” “Shrek 2” and the forthcoming “Shrek the Third”  joined the cast as the voice of Samuel, the sheep. Cedric the Entertainer and Oprah Winfrey lend their voices to married geese Golly and Gussy, respectively. “I’ve got small kids, and Charlotte’s Web is a favorite book. It’s definitely one of those stories that you have to read at night,” says Cedric. “It was fun to bring one of these characters to life and to do something that my kids can enjoy. “And then to be married to Oprah was another key thing,” he smiles. Kathy Bates lends her voice to Bitsy the cow. The venerable Bates is amazed by the way that technology like the kind used in “Charlotte’s Web” has expanded the range of an actor’s roles. So how, exactly, does an Academy Award-winning actress portray a cow? Bates was thrilled to be working alongside Reba McEntire, who plays Bitsy’s partner in sarcasm, Betsy. Corn-happy crows Brooks and Elwyn are characters that were expanded on from the book. The pair is played by Thomas Haden Church, who received an Oscar nomination for “Sideways,” and André Benjamin, also known as André 3000, the singing half of Outkast. Another stellar addition to the stable of voice talent was Robert Redford, who had been working on another project with Gary Winick and starred in the Avnet/Kerner film “Up Close and Personal.” The director was pleased when Redford agreed to play the crusty horse, but he also found himself in an unusual position. Voicing the character of Wilbur is ten-year-old Dominic Scott Kay. The filmmakers considered hiring another actor to voice the older Wilbur, but they were so impressed by Kay that they changed their minds. Shooting “Charlotte’s Web” was a vast and complicated undertaking. “This was an extremely complex movie, because we combine live action, animatronics, children, stunts, and CG animation  sometimes all of them at the same time,” explains Jordan Kerner. The filmmakers spanned New Zealand and Australia looking for landscape that felt like the state of Maine. They found it in Victoria, Australia. The Arables’ and Zuckermans’ farms and surrounding buildings were built in Greendale, and stage work was done in Melbourne. The fair scene was shot on a vast cricket field in Heidelberg. A talented creative crew was assembled, including director of photography Seamus McGarvey, costume designer Rita Ryack, editors Susan Littenberg and Sabrina Plisco, and production designer Stuart Wurtzel. Wurtzel, an Oscar nominee for “Hannah and Her Sisters,” designed a variety of structures, including the Arables’ home, the Zuckermans’ home and barn, the smokehouse and other farm buildings, and the cornfield. Because the weather changes in an instant in Victoria, the production had to be prepared to switch from stage to location at a moment’s notice. Wurtzel built perfectly identical barns on the soundstage in Melbourne and on location in Greendale. The filmmakers also wanted the film’s aesthetics to resemble E.B. White’s descriptions and Garth Williams’s beloved illustrations as much as possible. In addition, as an homage to Williams’s iconic drawings, Winick and his team recreated the drawings on the screen. “Whenever possible, I tried to duplicate as best I could the illustrations from the book,” he adds. Some of these “live-action drawings” include the image of Wilbur from the trough; the “some pig” web; the crowd at the Zuckerman barn; and many others. The head trainers were Larry Madrid and Larry Payne from Birds and Animals Unlimited, who oversaw all the animals on the set  the pigs, cows, geese, sheep, and horses that play the animals in the barnyard. On any given day, there were eleven animals on the set, overseen by their respective trainers. “Obviously, we knew that animals were going to be a big part of the movie, but I was amazed by the amount of work they needed to do to pull it off,” says Winick. For starters, the pigs had to be bred in Australia due to that country’s strict six-month quarantine laws; as a result, the trainers could not use any pigs they’d already trained; they had to start from scratch. Also, as young pigs can learn only one trick and grow at a rate of a pound a day, the trainers had to have as many as 25 pigs on the set on any given day so that the right pig doing the right trick could be captured on film. In total, the filmmakers called upon 47 different pigs to play Wilbur. With the help of a top-notch cast and crew, Winick made it through principal photography. Because the shoot required pigs of different ages  and because the weather would often not be suitable for the planned scene  Winick got creative with the schedule. “We shot for at least thirty or forty days without one scene completed because of how many pieces of the puzzle there were,” he says. Winick and his young star decided to form a united front. “Dakota and I would always say to ourselves, ‘It’s Charlotte’s Web; it’s only going to come around once in our lifetime. Let’s stick together and we’ll pull through,’” says Winick. Five visual effects houses joined forces to create the computer-generated effects: veteran visual effects wizard Phil Tippett in San Francisco, Rhythm and Hues in Los Angeles, and Australia-based houses Fuel International, Digital Pictures, and Rising Sun. Through the Cine Sync program developed by Rising Sun, Winick, Kerner, and the visual effects staff could fully communicate in real-time even when thousands of miles away from each other. Jordan Kerner wants nothing less than that the audience will feel transformed by the film, just as the barnyard was transformed by Charlotte. “This great classic book deserves to have a great classic film,” he concludes.